In a highly-charged meeting, supporters of Elk Grove Mayor Ly tried to change the candidate endorsement procedures of the Elk Grove-South County Democratic Club. 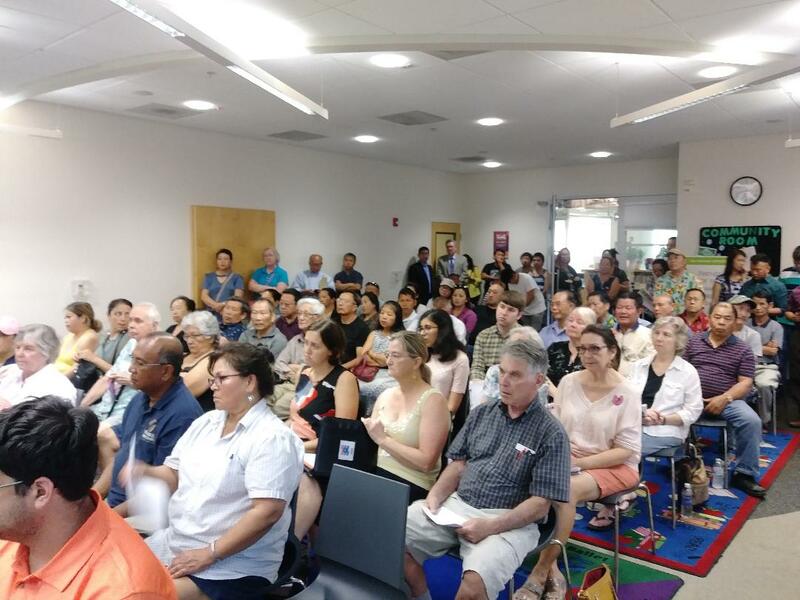 In a standing-room-only meeting that drew close to 150 participants at the Elk Grove Public Library, Ly supporters sought to bypass club bylaws and have an immediate vote on who the club would endorse for mayor. Ly, who was first elected to the Elk Grove City Council in 2014 then mayor in 2016, is seeking his second two-year term. In a race that is expected to be competitive for all entrants, Ly is facing fellow council member and current Vice Mayor Darren Suen and political activist Tracie Stafford. Although the motion to suspend the endorsement procedure was withdrawn by the club member who brought it forward, it was not before an often contentious floor discussion that lasted over an hour. During this time, Ly supporters, many of whom were new club members, said the process should be changed to have an endorsement vote at the Tuesday night meeting. 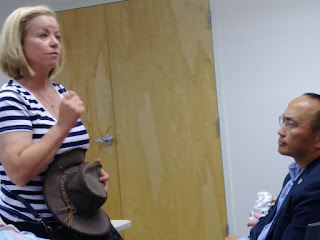 The groundwork for the evening's events was laid at the May meeting when Ly brought an estimated 126 supporters to join the club so they could participate in the endorsement proceedings. A follow-up audit by the club found that several who joined last month were not eligible because they were either not registered to vote, or were Republicans leaving about 25 of the group eligible for membership as of last night's meeting. The matter was first brought up during the club's discussion on the endorsement process by club member and Elk Grove Mayor Steve Ly. Expressing concern about the planned September club endorsement vote, Ly said he would like to see it the process expedited given Sacramento County's new voting process. "I'm curious, what does the timeline look like," Ly asked. Club president Kendra Lewis addressed Ly's concerns by saying the timeline of the process could be changed to August from its current target endorsement date in September. After Lewis gave a lengthy explanation of the process undertaken several months ago on how the endorsement process was handled with club membership, a Ly supporter made a motion that the endorsement vote should happen immediately. "The delay should not take place, we have a lot of members here, so I want to call the motion," Mr. Xingyn said. "I want us to endorse Mayor Ly because he has supported our school system, our kids, and our community as a whole." was an attempt to hijack the democratic process. The motion opened up a lengthy and spirited conversation among club members regarding whether it could be made in accordance with club bylaws. Intervening on behalf of Ly supporters was club Vice President Scott Matsumoto who said the club bylaws could be suspended allowing for a vote on the motions. Among several people taking the floor was immediate past president Dan Schmitt, and Ly's two Democratic mayoral rivals Suen, and Stafford. All expressed concern in different ways that the suspending the bylaws and having an immediate vote was patently unfair. "So we are talking about suspending the bylaws, so the club can take a vote to endorse Mayor Ly," Schmitt said. "Where is the fairness, we had a process, the process is to give all candidates an opportunity to come before this club to make their case." Addressing the motion to suspend the by-laws for the benefit of Ly, another club member spoke in stronger terms opposing the motion. "To all the supporters of Mayor Ly, before you vote, to do this, you need to understand, that this is a hijacking of the democratic process," Melanie Herman said. "This is not going to help Mayor Ly, because the article that is going to come out in the in the newspaper tomorrow or the next day, is going to be 'Mayor Ly supporters hijack a Democratic club meeting' in order to endorse the mayor and not give the other candidate the process to go through the endorsement procedure." Addressing the club during the floor discussion, Stafford suggested the maneuvers initiated were indicative of how some attempt to subvert democratic processes. "This is the reason I am running for office, it's about hijacking the democratic process," she said. "That's what's happening here, it's not about July or August [endorsment votes], it's about bringing folks in to specifically endorse Mayor Ly." Stafford went on to say "if this is what is happening in public, what's happening behind closed doors, this is why I am running for office." After hearing the various argument, Mr. Xingyn dropped his motion to suspend bylaws and have an immediate vote on the endorsement. A substitute motion to have the endorsement vote in July, before the close of the candidate filing date in August, was introduced and won by a simple majority. After the meeting, Mr. Xingyn said he brought the motions so whoever received the endorsement could have ample time to publicize the endorsement to voters. Reached after the meeting, Suen said he was taken aback by the actions initiated by Ly's supporters, but noted he was comfortable with the July endorsement. "I was surprised to walk in and hear deliberation to suspend normal procedure and endorse the current mayor for the mayoral election," Suen said. "I'm glad that good judgment prevailed tonight to ensure that all candidates can have a fair chance to be heard and earn the Democratic Party endorsement." Ly did not respond to an offer to comment on the proceedings extended through one of his aides. Commenting on the evening's proceeding after the meeting, Stafford noted, "When people show you who they are, believe them." UPDATED 5:30 p.m. - A person mentioned in the story was mistakenly identified as Gail Hemsley. The person is actually Melanie Herman. We are attempting to verify the spelling of Mr. Xingyn, and an update will be added once verified. A recording of the floor discussion on the matter is available. If you are interested in receiving a copy, please contact EGN.